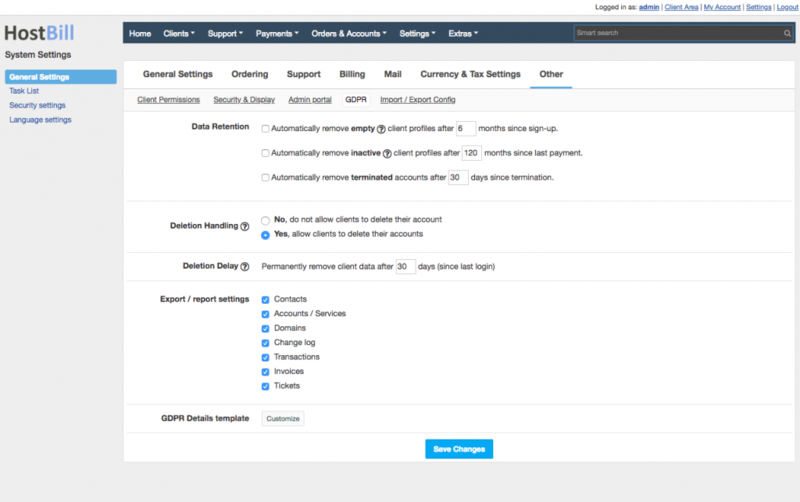 New release: Bancontact payment method, new password and data retention settings, Plesk SSL widget and more! New HostBill release is ready for download! This week we’ve got for you Bancontact payment method support, new password settings, new data retention option, SSL widget for our Plesk module some further improvements to admin area navigation and more! In HostBill, to ensure maximum password security you can enforce your clients and staff members to set the passwords according to the pre-defined rules. You can set minimum password length and allowed/required characters. From now on, we’ve also added option to set blacklisted characters for random generated passwords. Characters set in the ‘disabled characters’ field will not be present in random generated password. To manager your password settings in HostBll go to Settings -> General Settings -> Security Settings -> Passwords. The GDPR regulation introduced last year by the European Union gives individuals the right to control over how their personal data is being collected, stored and used. HostBill has introduced a set of tools to help our customers comply with the regulation. Now we’re adding another option: to automatically delete terminated account after configured period. Related invoices and orders will not be removed. The account removal will be logged. New HostBill release comes with dded support for Bancontact payment method for Buckaroo gateway. Bancontact is one of the most popular payment methods in Belgium. A payment with Bancontact is very simple for your clients. On the payment page the consumer selects Bancontact, following this a secured connection is created which lets the consumer select their bank. Following that, the consumer is directed to their trusted internet banking environment, where they can log in. In the following screen the payment can be completed. Due to the real-time connection with Buckaroo you will always be informed of the status of your transaction. Plesk is a multi-functional and multi-level control panel with a wide range a features to easily manage all aspects of a hosting business. With Plesk module for HostBill you can build a complete hosting platform and give your customers the opportunity to manage all aspects of Plesk hosting directly from a single pane of glass billing interface, without the need to login separately. With the latest release we’ve added a SSL Certificate management client function. With the Plesk SSL widget you can now easily manage the domains. We continue to improve admin area navigation. In this release we’ve added number of pages to display per listing in client-related quick-lists (services, domains, invoices, estimates, recurring invoices, orders, transactions and tickets quick-lists). In this release we’ve also added support for importing Godaddy domains & DigitalOcean droplets! Speaking of DigitalOcean, customers can now re-use their SSH key on multiple VMs. We’ve also added the support for SSH cart form resulting auto-creating vm after order. Some enhancements have also been added to OVH Dedicated Servers module: a selection of OS templates in the product configuration that will be available in the client area. The list of OS templates has also now been sorted. For the full list of features added and bug fixed please see our changelog!.